O.K., so I didn't blog from the cruise like I said I would but at 55 cents per minute for internet I think you can forgive me. I have to preface this posting with the following statement so I don't get a lot of cruise lovers raging mad, "One cruise does not a cruise expert make." I admit it, I have no other comparison and I wish I were writing to tell you we had a wonderful time but we didn't. It is possible we're just not "cruise people" because my overall reaction was one of utter disappointment. I blog so you'll have good travel information and for better or for worse I have to give you my honest opinion. I'm not saying I'd never do it again but it would take a lot of convincing. Let me back up for a minute and say that we were very excited about this trip. I pictured relaxing with my family, delicious meals, fun romantic evenings with my husband and my child having a blast at the kids club. It wasn't a horrible experience; it just wasn't really worth it. Maybe it's just best to list the pro's and con's. All three pool areas were overcrowded except on the day everyone else went onshore. In fairness to the cruise line the pools are very popular and I do believe some people left their stuff in chairs all day even if they left for 2-3 hours. Luckily I got over sun worship in my twenties. Rock climbing looked totally awesome but was a little intimidating for my 11 year old. The basketball/volleyball court looked great too and was highly popular with older kids and some adults. Miniature golf was a lot of fun but in total disrepair. Ping pong, inline skating (teeny tiny area) and golf were all very crowded and inadequately staffed or provisioned. Ice skating was rarely available. I think only 4 - 45 minute sessions during the entire cruise. The Promenade (mall) consisted of a couple shops (liquor, clothing and jewelry) and bars. There was a nice casino but it was not well ventilated (I'm really picky about this), a couple night clubs and a spa/fitness area. I loved the wine bar and thought the tapas they served with wine were very good but the bartender didn't even have a napkin to spare and let us know he was understaffed and not very happy about it. I really didn't care. I just wanted to enjoy my expensive glass of wine and my delicious tapas. It would have taken him less time to just go get some napkins. Aren't bartenders supposed to listen to their customers woes not the other way around? Yep! I over packed as usual but our ocean view stateroom was surprisingly comfortable for the size (plenty of storage). The stateroom staff was great our bed was made up more than once a day and we always had fresh towels! We loved the "towel origami" (like the monkey pictured above right). It bares an uncanny likeness to my husband after his sixth or seventh Guinness. Fun, romantic evenings consisted of bars since we were warned by several other cruisers not to waste our money on the upscale restaurants as they had this trip. There were plenty of nightlife options and the bar entertainment was pretty good unlike the theatrical performances which were below average (I thought the illusionist was o.k. but my husband wanted to leave badly). The Aussie pianist, Darren, at the Schooner Bar was pretty talented and entertaining and we thoroughly enjoyed his sets. The spa was very nice and the adult only section of the boat which included the spa and gym was beautiful. 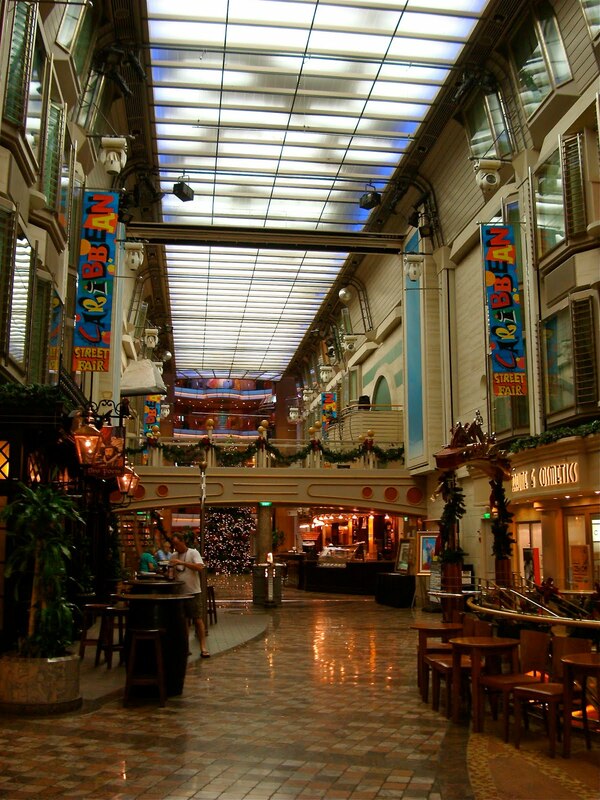 The Promenade and bars were attractively decorated. Drinks were good and reasonably priced. Kids Adventure Club was very convenient but according to my kid only fun because of the other kids her age with whom she wanted to hang out. Even though it was designed to keep the kids in age appropriate groups and activities almost every night they combined them with the younger kids and for that reason she was not so thrilled with it. Ultimately the biggest disappointment had to be the food. Although cruise food is purported to be fantastic, overall it was pretty lousy. At the buffet it was difficult to find a clean table and the staff seemed uninterested. While there was plenty of food it was often either overcooked, dried out or tasteless. The formal dining room was much better but not great. Twice I received cold food. It was quickly replaced the first time (cold escargot) but I didn't bother the second time since it was cold and awful (the eggs were overdone and the Hollandaise sauce was the consistency of thick pudding). On more than one evening I drank my neighbors untouched water because the waiters were not very attentive (they were very nice just not so great at service which I found perplexing since most of the time they were standing within a few feet of us). I ordered a bottle of wine the first night which I had with meals for two evenings (nice touch) but on the third night no one even asked me what I wanted to drink. My husband's beer glass was left empty on the table. He loves his Guinness so if you just ask he'll have another. I had one good steak so I ordered the same the next night but it was not the same, not at all. I could go on but let's just leave it at we threw more food away than we ate. So most of our trip was spent, you guessed it, hanging out at the bars. That's why my husband said the cruise ship was really just "a big floating bar". Sadly, I'd have to agree with him. The trip was not a total loss. We did not go in to Cozumel because we wanted to enjoy the ship when it wasn't crowded and we weren't interested in excursions. We had a relaxing morning poolside followed by a little arcade time and for me a Spa treatment. The view while in port was beautiful (pictured left). We did meet some really nice people, many of whom cruise often. Most of them said the food on this cruise was substandard in their view as well and that this cruise was not typical of their experiences. One such person, a travel agent, recommended we fill out our survey to the attention of Food and Beverage Manager (we did). Many of them recommended we give another ship or cruise line a try. This cruise may have been a bad example, however, after spending that kind of money I don't know that we want to risk it again. I'm very interested in knowing what cruising has been like for any of you. So please let me know in your comments below. Don't leave out the cruise line, ship or destination. 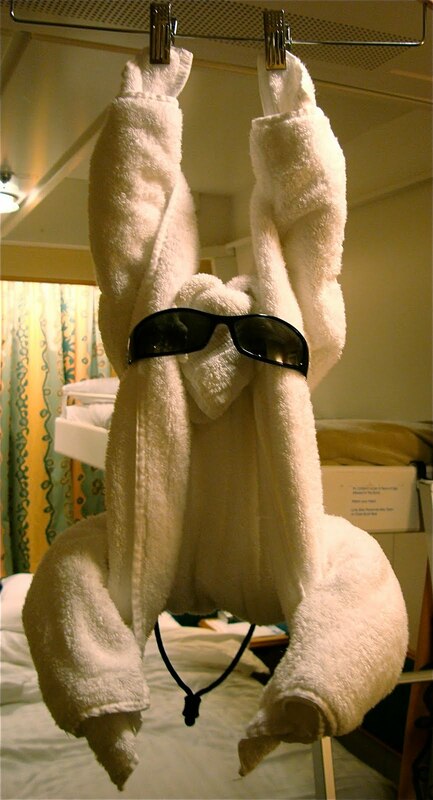 I'm sorry to hear your cruise wasn't what you expected. I've only been on one cruise and had a great time. It was a Carnival cruise, and the ship was the Inspiration. Of course, my expectations were a little different. I went with a group of people and we weren't looking for anything romantic. A floating bar was exactly what we were after, and the Inspiration delivered. The food was also excellent. I had several steaks during my four-day cruise and all were very good, though not as good as a high end steak place. Coincidentally, some friends of mine are asking me to make a more-or-less immediate decision about whether to go on another cruise in January. While I like cruises, I think I'm going to pass. My near-term travel budget is aimed at Los Angeles. High expectations are never a good way to start a vacation. The world should know that you like only the best. I love cruising, but I'm easily pleased. We've never had a bad meal on Princess Cruises. 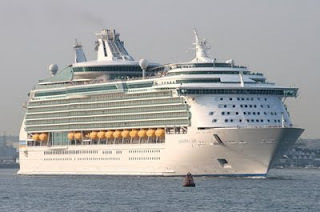 This post is really very interesting and impressive to read about.It would be truly an awesome pleasure if got a chance to travel through such cruise in my life.I think it would be one of the most memorable trip in my life.